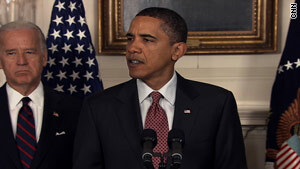 President Obama's job approval is at 49 percent, according to a recent CNN/Opinion Research Corp. survey. (CNN) -- One day before President Obama delivers his first State of the Union address, a new national poll indicates that Americans are divided on job he's doing in office. According to a CNN/Opinion Research Corp. survey released Tuesday, 49 percent of the public approves of the job Obama's doing in the White House, with 50 percent disapproving of how he's handling his duties. Fifty-five percent of people questioned say they don't think Obama has paid enough attention to the most important problems, with 45 percent saying he has the right priorities. And 6 in 10 feel the president has paid more attention to financial institutions rather than the problems faced by middle-class Americans, with 28 percent disagreeing. But 63 percent say Obama is sincere and 6 in 10 say he's a strong leader. Fifty-nine percent of people questioned say the president is honest and trustworthy, 57 percent feel he inspires confidence, and 56 percent say Obama is in touch with Americans. "Most Americans have a positive view of Barack Obama's personal characteristics, but they don't feel the same way about his positions on the issues or his track record in office," said CNN Polling Director Keating Holland. "Independents think Obama is a strong leader and they see him as honest, but only 42 percent of them say they agree with Obama on the issues." The survey also indicates that Americans are divided on whether Obama can unite the country, if he's doing a good job keeping promises he made during the 2008 presidential campaign, and whether he has accomplished what they expected he would during his first year in office. The CNN/Opinion Research Corp. poll was conducted January 22-24, with 1,009 adult Americans questioned by telephone. The survey's overall sampling error is plus or minus 3 percentage points.